Surrounded by the lush greenery, blooming flowers, palm trees, Spanish moss, and ever-present sunshine, a well-cultivated feeling of escape permeates the air even before arriving at the Ritz-Carlton resort. This is why Naples, Florida is essentially a sister city to communities like Hinsdale during the interminable months of cold temperatures and gray days that make up our standard-issue winter season. Orchids flower on the trunks of trees leading up the driveway of the newly remodeled Ritz Carlton, Naples, and an elaborately designed flower arrangement draws you into the massive lobby and welcomes you to the ultimate getaway. The first stop is settling into your room. All 450 guest rooms were revitalized in the remodel, bedecked in warm beach tones that bring the natural beauty and colors of Naples environment indoors. Upscale linens and clean lines are combined with seaside accents like coral sculptures and oyster shell mirror frames. Still, the most hypnotic thing about every room is the breathtaking view of the Gulf of Mexico and the petite balcony from which to enjoy it. A quick scan of the other balcony doors reveals that every door is thrown open wide, letting in the Gulf breeze and sound of the waves, which also serves as a lovely soundscape while laying in bed at the end of a long, sunny day. Everything about the resort is meant to provide anything a family needs to slip into a complete state of relaxation and fun. The family pool is the liveliest spot, as kids splash around and their grownups lay in the sun. Next to that is the relaxation pool, surrounded by cabanas and a tacit agreement that this pool is more for swimming and lounging than splashing. Wooden decks provide the path that take you from the hotel, across a small patch of Florida eco-system where you might see Egrets, River Otters, or Red-bellied turtles, to the stretch of pure white sand and salty sea water of the Gulf. Upon checking in, you’ll receive an activity guide catered to the week of your stay. Flipping through the guide is an excellent example of what makes the Ritz-Carlton experience such a family-oriented vacation spot. Every day has different kids and family activities listed. From the basketball court and bean bag toss lawn to special activities like giant dodge ball games, temporary glitter tattoos, potato sack races, and cupcake walks, the kids will never be short on ways to play. Not to mention the Nature’s Wonders center, a sanctuary for sea creatures, with 11 aquariums filled with fish, crabs, sharks, and an eel, and a lab full of lab coats and microscopes for examining the aquatic finds. Threaded between the games and activities for the kids are options for group exercise classes from Yoga to Zumba or simply 24-hour access to the fully decked out fitness center. A quick ride to the Ritz-Carlton Golf Resort gets Dad teed up on Tiburón, the Greg Norman-designed championship golf course, with club rentals, a Peformance Lab, and a PGA Experiences TOURAcademy. For Club Level guests, the Club Lounge is located on the 14th floor of the resort. Upon entering, a private concierge greets you and gives you a brief tour of the lounge and library exclusive to Club guests. Five separate complimentary meal presentations appear in the lounge throughout the day from a continental breakfast, to an evolving selection of small bites throughout the day, culminating in desserts and cordials. A full range of complimentary beverages are available throughout the day as well, including a Club-only bar down on the beach in a section of the beach chairs reserved for Club guests. With a large Concierge team dedicated to taking care of only the Club Level guests, it’s definitely the way to make the most of a Ritz-Carlton vacation. For those who really want to slip into full luxury-mode, the Ritz-Carlton Spa, Naples is a world-class escape from everything. Their signature scent, Lemongrass Basil, hangs in the air, immediately drawing you into a peaceful frame of mind. Each dressing room leads onto an aqua spa lounge with a waterfall whirlpool with hot and cold plunges, eucalyptus steam room, sauna, relaxation suites, and access to the replenishing outdoor mineral pool. One floor up are more than 30 treatment rooms where experts dole out massages, facials, and wraps. Afterward, get a light, healthy meal, smoothie, or juice at =H20+, the perfect capper to an afternoon of extraordinary relaxation. Before heading out to enjoy the Ritz-Carlton’s private stretch of beach, have some lunch at Terrazza. A new addition with the remodel, Terrazza features mouthwatering Italian cuisine. It’s also the main choice for all-day dining at the resort, with a breakfast buffet in the morning and lunch and dinner menus. Though many opt for dining on the patio, the entire west wall is floor to ceiling sliding doors that open up, bringing the feeling of dining on the Gulf to everyone inside. It’s also one of six restaurant options on the property. The Grille has been a dining destination for the locals for years as well as the guests. With a wine list that’s heralded an Award of Excellence from Wine Spectator magazine, this premium steakhouse is the place to do some fine dining. Eschewing the country club vibe for a sleek gray redesign, The Grille’s look has contemporized, retaining crystal chandeliers as a nod to their traditional roots and leaving the menu intact, as it’s made up of the favorites of regulars. The most atmospheric place to grab some dinner is DUSK, where they’re famous for their sushi and a menu of specialty cocktails designed exclusively for the venue. The new décor is flawless, with shelves of lanterns lined up casting a soft warm tone, a bar that emanates the yellow glow of sunset throughout the room, and an indoor Asian patio with low couches make DUSK a sleek night out for anyone 21 and over. Bites is the new tapas-style dining option for those who like to sample a lot of delicious offerings. Located in the lobby, with nightly rotating live music, the delectable small plates, crafty cocktails, and the rosy glow of sunset through palm fronds out of the massive lobby windows make Bites an incredible option for dinner. Also a part of the ambitious remodel were the resorts event spaces: two huge ballrooms; Aritsans, a glitzy reception room with private courtyard access; and the two-story Beach House, directly on the beach with incredible views no matter where you turn. Still, the main attraction has to be jumping in the waves of the Gulf and lounging on the fine, white sand. After a full day in the sun, having dinner at Gumbo Limbo, the beachside boardwalk restaurant, is every vacation fantasy that’s been cycling in your head through the last three cold months. The smell of sunscreen, a tall drink in your hand, the sun setting over the water, and a warm breeze moving through the palm trees. That sounds like the perfect antidote to every winter. 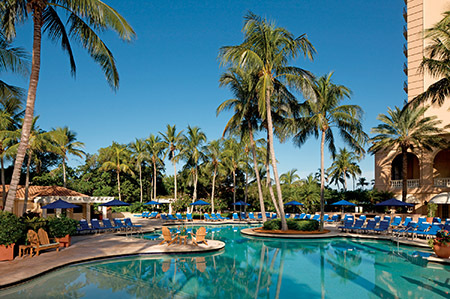 To book your stay or for more information on the Ritz-Carlton, Naples call 239-598-3300 or visit ritzcarlton.com.